Iman Ansari: When we look at the work of Frank Gehry or Thom Mayne, as LA architects, there is a certain symbolic relationship to the city evident in the work: the industrial character of these buildings and elements of the highway or automobile culture that tie the architecture to the larger urban infrastructure, the scale of the projects, as well as the conscious use of materials such as metal, glass or concrete. But as free-standing machine-like objects sitting at the heart of the city these buildings also embody certain ideals and values that are uniquely American, such as individualism, and freedom of expression. 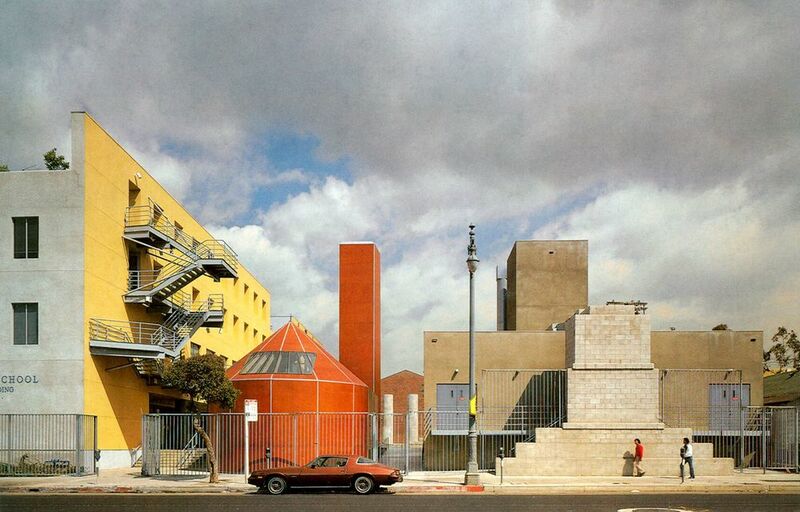 In your opinion how is Frank Gehry's work tied to Los Angeles or the American culture? Edwin Chan: Absolutely. I think Frank's work definitely has DNA of LA as a city. We talk about the idea of a democratic city a lot, and coincidentally Hillary Clinton mentioned that in her speech recently saying: “We need a new architecture for this new world, more Frank Gehry than formal Greek,” because it's the expression of democracy. In that sense you could think about the building embodying certain type of values that are manifested architecturally. You alluded to a lot of them already, like diversity of materials, the scale and the heterogeneity, and those are also the DNA of the society we live in. But for me personally, I think in addition to everything you talked about, there are two main urban aspects that stand out: First one is light; LA is a city that you are very much aware of its unique horizontally. When you are in the city, you are constantly seeing the sky and the sky is always a part of your peripheral vision - as opposed to a city like New York where you are always surrounded by buildings - and because of that, you are very much aware of the change in light. Therefore, the architecture and also the materiality of architecture always have to be very sensitive towards the light. And sometimes they are very important part of the decisions. This approach also carried along to some of the projects that we worked on internationally. For example, one of the reasons we used Titanium in the Guggenheim Museum in Bilbao was the way it reacted to the light in the city. It wasn't a stylistic decision per se. As you know, Bilbao is a city with heavy industries and steel, and we knew from the beginning that the building would be of a heavy metallic material that would speak about the industrial character of the place. So we looked at stainless steel and other materials for a long time but we didn't like the way they responded to the light. In northern Spain it rains lot and we wanted a material that would radiate a kind of warmth and bring the sky into the building. So that is why we came to the decision to use titanium in the building. In other places we used other types of materials. So it really depends on where the project is. But the idea of materiality and how it responds to the light is a very important thing, and I think we developed that sensitivity from LA. The second aspect is the mundane quality of the city. In other words, when people visit LA, especially Europeans, they notice a very different kind of city than a traditional city. Part of it is the kind of "mundane" quality. But at the same time there is a beauty in the mundane. So how do you capture that quality? And how do you bring that into people's awareness? A lot of times people are in denial about that. Frank talks about that also, and that's how he arrived at the chain-link fence. It's a material that people use in their front yard all the time but when you use it as architecture people start to question it. So it's about bringing out those kind of values and focusing on it. In some ways it's very Duchamp like, you know. Because it is part of a kind of sensitivity that came from modern art: to give value to mundane things or emphasize the beauty of the mundane. Iman Ansari: Looking at Spiller House in Venice, California, which is one of Frank’s early projects, we see that interest in using the mundane corrugated metal or wood. But beyond that I think even the way the house is assembled and how the materials come together express that mundane quality. The materials seem so raw, untreated or unpainted, and you can actually see the joints and connections that bring them together. Edwin Chan: That is true and part of this has to do with the construction culture in the west coast and the use of two-by-four wood framing and corrugated metal. Also there is an unfinished aspect to the building, which is one of the characteristics of Frank's early work. But I think this project is important because it is very much part of the street-escape. The building on the front has a lower piece, which relates to the street scale and adjacent buildings, and there is a second piece in the back that is taller. So in Frank's work there is always this idea of breaking the building into smaller pieces as a way to address the scale. You can also see that kind of scale and aesthetic is very much aligned with other buildings in Venice, California. So there is a unique industrial character to it that makes it fit right in. Iman Ansari: You spoke earlier about your interest in art, and that one of the main reasons that attracted you to Frank Gehry’s work was what you saw as a strong connection with the art world and the dialogue with the artist. Art is of course a vast concept and could often be ambiguous. What is your definition of art? And what aspects of art are you particularly interested in? Edwin Chan: It is interesting because if you sit down with any architect I know, they would tell you exactly that they are interested in art. And I cannot imagine one architect who would tell you that they aren't interested in art. So in some ways it's a little bit of a cliché for me to say that. Although I would have to say that I am much more visual because my eyes are much better developed than my ears. As I worked, through the projects that I have been involved in, I shied away for the longest time from concert halls, and I have been more interested in museums. So for me art is visual. But I think nowadays, as I mentioned to you earlier, the younger generation of artists work in multidisciplinary ways, which is also interesting for me. I admire artists who work in traditional mediums, but I think I'm more interested in artists who work with different types of media. And although I said I was interested in art, I never fantasized myself as a sculptor or a painter. I do like taking pictures, but I never have the patience to paint or make a sculpture. I think for me it's the dialogue with the artist that is interesting. Because the issues that interests artists are in some ways more tactile or less theoretical. So the discussions that you would have with the artist on the creative process are usually in different kind of topics, and that is what interests me and excites me. Iman Ansari: So in that sense, do you consider architecture as another medium of art? Edwin Chan: I wouldn't define it like that. I think in a sense we are all involved in a kind of creative endeavor and I think that architecture is one of many different creative endeavors. I hesitate to label it because I don't think it's healthy to think about it that way. It’s just that in architecture, the medium that we choose to express these ideas happen to be the built-environment, whereas the artists might have chosen a different medium to explore the same set of ideas. Iman Ansari: I would like to talk about the Chiat/Day/Mojo building. This project is particularly interesting for me because of what you were describing as the dialogue between art and architecture. 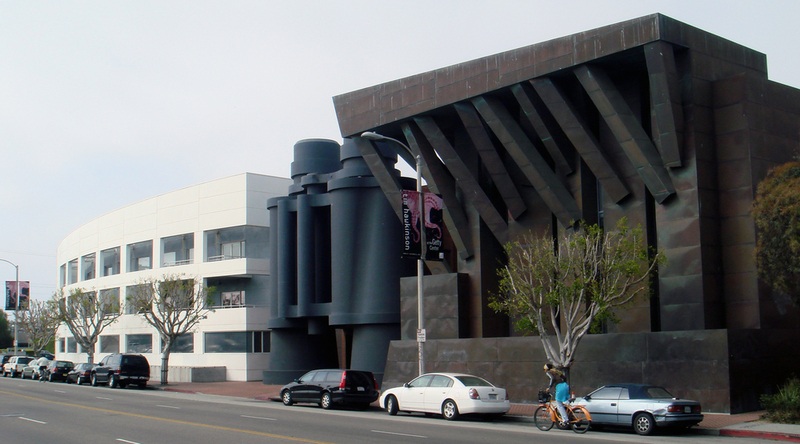 The large binoculars here is a collaboration between Frank Gehry and sculptor Claes Oldenburg. Claes' work here is interesting, and ironic, to me especially because his work is about taking everyday-objects and building them out of scale. Edwin Chan: The building was designed at the time for Chiat/Day/Mojo advertising company, but is now owned by Google as a part of their Los Angeles campus expansion. Jay Chiat was a longtime friend of Frank. Jay really wanted to create a building that would encourage creativity. So going back to your question; is this art or is it architecture? Of course the binoculars were collaboration between Frank and Claes. He was one of the important pop artists of the time (in 1960s). A lot of people looked at the building as a kind of pop architecture with the binoculars. But I would like to think of it as a kind of urban response. When you build anything in Venice, California, you have a height limit of about 30 feet. So when you think about the building in relation to the street, what do you do to address the street? You also have to keep in mind that when this building was done in the 1980s, the discourse of architecture was post-modernism. And you had people like Michael Graves who were doing this kind of flat two-dimensional facades. So one way I suppose - and this is just a speculation - is that, as opposed to making a flat facade, is to create a facade that addresses the street with a series of objects or sculptures that have depth. Iman Ansari: The building does look like it could be three or four different type of buildings, and even done by different architects. But what's interesting to me here is also the breaking of the scale. Because considering the 30 feet height limit, if you were to have a monolithic expression, the street front of the building would appear short and very long. Edwin Chan: The other way to think about it is that for Jay Chiat, there were other specific programmatic requirements. So the idea was that each element here would express some aspects about the program of the agency by expressing the type of spaces inside. Even within the binoculars there are meeting rooms and they are actually using the spaces inside. And when you look at the back of the building also has its own unique expression with punched windows. Iman Ansari: Are you suggesting that the binoculars are not just a sculpture or art, but it is actually architecture? Edwin Chan: Well, this is a different type of topic and depends on whom you talk to. But let's just say that spatially it is inhabited and used in different ways. So the left wing has offices that have a different function than the offices in the right wing. And then in the middle, which is directly the entrance there are conference rooms and inside the binoculars you have more private meeting rooms. So they are not just sculptural pieces, but in some ways they project the different nature of their use and spatial requirements. And of course every single client would want to have more space inside their building regardless of what you do. So by expressing the building pieces with this variety it creates their uniqueness within the homogeneity of the whole program. Iman Ansari: I'm interested to hear more about the binoculars and the collaboration with Claes Oldenburg. Have the two done more collaboration together? Edwin Chan: Yes they have but this is the only one that was actually built. Frank has also collaborated with other artists of his generation like Richard Serra. One of the conversations that Frank had with Claes is the same kind of conversation we are having now, which is what constitutes art versus architecture. Either Frank (or Claes) at one point had said that “for it to become architecture it needs to have a window.” So they decided to put those small windows you see in the binoculars. Iman Ansari: Here in the work of Claes Oldenburg we see a piece of art - a large sculpture of a pair of binoculars - striving to become architecture at the expense of adopting domestic architectural elements; the sculpture becomes architecture by acquiring windows. But what do you think about the way art is perceived here? In the traditional conception of art - for example an impressionist or even cubist painting of scenery - the object of art (the painting) represents an idea or impression of a concept (the scenery) outside of itself. In modern or contemporary art however, when we look at the work of Piet Mondrian Composition series for instance, the object of art is the real idea, and it is not referring to or signifying anything outside of itself. But there are other artworks that have spatial and architectural characteristics imbedded within them. In my view, what Richard Serra has achieved with some of his work is a step further from the modernist movement in art, for not only the object of art isn't referential to an idea or concept outside itself, but it is also addressing and acknowledging the viewer in a fundamental level; the objects demand a cognitive interaction with the viewer, and in fact the meaning of the artwork lingers on that subjective experience, which involves or necessitates the practice of space. And this new subjectivity is something that is different from the sensual experience of the space. Edwin Chan: Well, I think it's very easy to draw a close correlation between Frank's work and Richard Serra's sculptures. For instance people think the big gallery space in Bilbao was designed for Richard Serra's sculpture and I would be the first person to disagree. In fact the sculpture came later and in my personal opinion, I'm not so sure if the sculpture looks that good in the gallery. But generally in Serra's work there is an interest in surfaces and as you know there was a period in Frank's career when he was exploring the fish as inspiration. The use of the aerospace software Catia enabled Frank to pursue that interest, and also in this case quite deliberately enabled Serra to pursue his work as well - since Frank introduced him to the use of that technology. So in that sense the similarity may be the overlap of the software and technology that enabled both the architect and the artist to pursue their own interests. But I think for me it is the idea of experience of the sensuality of architecture that I am interested in and people are often afraid to talk about. And that is why I have always been fascinated by the art because in some ways the discipline of art is much more free in addressing those issues. I think this also goes to a bigger question that is about the sculptural aspect of architecture. Historically I think there was not that kind of boundary between the artist or the architect. When I experience some of the work of Richard Serra it is very easy for me to say that I could live in the space of his sculpture. Or I think it's not so different to look at Frank's work and say it is very sculptural. So the idea of this kind of duality, that architecture in some ways is a living sculpture is the fundamental value system that we all believe in and a lot of architects and artists do that. I think it's important to erase that boundary between what is architecture and what is art. Iman Ansari: Do you think the binoculars were an attempt towards merging the two boundaries? Edwin Chan: I wasn't there at the time so I cannot talk about that experience. But I would think in some ways that was more intuitive, through their friendship and they wanted to use design as a vehicle to further artistic conversations. But the official story is that Frank and Jay Chiat were having a meeting in the office. Frank always has things that interest him in his office and around his studio. That day Frank happened to have a pair of binoculars that Claes had made for him sitting next to his desk. So they were talking about the project and they were brainstorming on what to do with the facade, and at some point Frank put the binoculars in the model and said it could be something like this! So it happened in that sort of spontaneous manner. Iman Ansari: I find the whole story interesting because even with Frank's exploration of the fish there is a similar approach to Claes’ work with respect to the idea of scale: taking the object - or the idea of the object - and building it out of scale. Edwin Chan: I would like to think of it a little differently. In some ways, going back to some of the things you brought up earlier, here there is an idea about movement and how to embody or explore the idea of movement in architecture, which goes back to the idea of the city. Because I think in some ways Frank's interest in the fish is a way to indirectly explore the idea of movement because the way the fish moves is very beautiful. And this idea of movement has been explored before in the baroque period or the modern movement and the work of Le Corbusier or Mies van der Rohe. So today with the technology, the idea of the fish is one of the ways to explore the idea of movement. Edwin Chan: And that is also why Loyola Law School is a very important project in Frank's collective projects, and an important millstone for Frank. It was a jumping point where he started to get larger more institutional projects. The project is all about creating public spaces. On a school day you see how the spaces are being used. It is about architecture making an urban landscape. Each one of these are buildings are classrooms. So part of the idea is to have the offices separate while the classrooms have their own identity and they start to make this spaces for the students. And a lot of the stairs here are the egress stairs and they are made as part of the architectural experience. Most people would put the egress stairs in the shaft space and forget about them. So, why not to make it as part of the urban experience? The buildings here are in a dialogue with each other. Iman Ansari: There is a mystic or uncanny quality to this project, which reminds me of the work of John Hejduk or Aldo Rossi. There is an idea of fragments of architectural typologies as well as grouping of individual buildings within a city-like landscape. The architecture here attains not just autonomy but individuality, and the buildings begin to communicate with each other. As an observer, you find yourself caught in that gaze or moment of encounter. Edwin Chan: This project is important piece of the puzzle. We talked about the early work and now you can start to see the continuity of the work in medium scale, which will continue all the way to large scale projects like the Disney hall and Bilbao. But in the end it would be interesting to think about it in a context of the evolution of all three kinds of work as a continuity of development of the certain urbanistic ideas about Los Angeles. It's not just sculpture for the sake of being stand-alone sculptures or to be iconic per se, but to be at the service of the experience and activating the public realm. Iman Ansari: Let's talk about the Guggenheim Museum in Bilbao. Oftentimes Bilbao Museum is thought of as the one single building that changed an entire city. And the reverberation of this “Bilbao effect” whispered new (urbanistic) possibilities for architecture. Do you see the Bilbao museum as the icon that transformed the city? Edwin Chan: I think a lot of people also think about Bilbao as a stand alone sculpture but they miss the point that when they first approached the Guggenheim and after competition we always think about it as an infrastructural project. In fact, at that time they already had the vision to create a master plan that included not just one building but an infrastructural or holistic approach in how they envisioned the city. So Bilbao museum is only a small piece of the puzzle. And I would say that is a common misperception about Bilbao. It just happened that we did a pretty interesting building. But the building has to be understood in the context of a larger vision which included the subway, new train station and series of other cultural buildings and a vision about the waterfront and everything else that they implemented in a very systematic way. So it’s not just one piece but it’s a synergy of different pieces that created that. Of course each piece had to be distinctive. But there were other cities that were under the impression that you could just make one building that would have the ‘Bilbao effect’ and it never really works that way. The architecture for the sake of being iconic without the program, infrastructure, the support, etc rarely succeeds. Iman Ansari: We talked briefly about Frank’s idea of reconceptualizing the practice of architecture, and I think with that comes a new process of production. And one of the things that interest me in that process is the use of models in Gehry’s office. From what I understand, the process always begins with programmatically color-coded massing blocks and studying different configurations between them. Once you arrive to that, then the project becomes a wrapping exercise and about how you design a surface or an envelope that contains the programmatic boxes inside. So how is this any different from the (Dutch) pragmatism where architecture is essentially about mediating program? Behind these beautiful surfaces will we find the same old boxes? Edwin Chan: This is a good point! As I mentioned to you earlier, "Rotterdam" was always a place of interest to me. But I think that one of the main aspects about Frank's work and my own personal interest is that architecture without program is not interesting. So in many ways, because the formal or sculptural expression of Frank's work is so strong, people tend to forget that the expression is ultimately of the program and the spaces inside. And I think maybe that is one of the main differences between art and architecture, which you were asking earlier, and that is: architecture has to address or express certain aspects about the program. And the program in this case is not just where the toilets are, but it is its’ purpose. Whereas in art, it's a different kind of program, and to me this is the biggest distinction between the two. It's not scale or form, but it's purpose. Because of that, a lot of time in the design process in Frank's office is dedicated to the exploration of the program, even before one would discuss the formal attributes. And the configuration of the spaces or the volumes is absolutely an integral part of architecture. But the massing blocks are also a way of engaging the client in the process so that you can have a dialogue with them. Iman Ansari: So once you arrive to that moment when the configuration of the massing blocks works, you begin wrapping them with surfaces. The massing blocks are essentially rigid rectilinear wood blocks while the paper surfaces wrapping them are formative and fluid. So, what happens to the space in between the surface and the block? Are they poche spaces? Do they ever become program themselves? Edwin Chan: The arranging of the boxes is essentially a process of rational thinking for a lack of a better word. So in some ways the developments of the blocks take the project into the point where you can escape reason into intuition. This is when the boxes are replaced by three-dimensional volumes. Iman Ansari: so are you suggesting that the interior surfaces are also following the exterior expression of the building? Edwin Chan: Well, that would be the goal. Iman Ansari: We talked about the unique process, and the inclusion of technology which Frank's practice pioneered. But that also changed the way architecture was made: from a practice that traditionally began with drawings and diagrams and then moved to physical models, here we begin with sculpting the physical model, and then the object is scanned and translated to a three-dimensional digital model, which drawings are produced from. It is a reversal of the traditional process of architectural production, and because of that the expression of the three-dimensional form and the spatial composition of the model supersede the precision and geometric relationship of two-dimensional drawings. You are no longer designing the plan or section, but the three-dimensional object (model) as a whole. You also spoke about your own interest in drawing as a student, so in your view what is the implication of this shift in architectural production and representation today? And with advancement and integration of technology, what is the role of drawing in this new practice? Edwin Chan: I think drawing here in some ways is about sketching in 3D. So when you are talking about the models, the way I see it and I experience it, is that I have learned how to sketch in 3D as opposed to 2D. And a lot of the stuff that you were referring to as the paper models was a way of freeing yourself in the sketch model, more so than the distinction between the wood massing blocks and the curved surfaces. It is a shorthand and it is not really literally per se, but it is a gesture. So in an ideal world if the technology was evolved and was sophisticated enough you would be able to sketch in a hologram or some kind of device like that. But since we don't have that luxury, you would have to just live by messing around with the paper models. Iman Ansari: But drawing hasn’t only been a representational tool, but also an analytical tool for exploring and communicating ideas. Do you think that analytical aspect of drawing in architecture is beginning to diminish in the digital era? And how can we reconceptualize the role of drawings in today's practice of architecture? Edwin Chan: I agree with that and today when I look at computer renderings I think they would fit in a category of drawing as representation and I think throughout the history of architecture you have always resisted that because representation is always lower than analytical drawings that are about exploration. So in that sense, I would be interested in the computer technology in the sense that they are explorations of geometry rather than being its representation. If you use the computer right, you could achieve the same kind of analysis or analytical knowledge as say Peter Eisenman's axonometric drawings had done back then, using the computer as an analytical tool. Iman Ansari: You talked about the paper model being a shorthand for a 3D sketch drawing. But the quality and characteristics of paper, as a material, remains present in the architecture. At the end, the stainless steel or titanium panels of Frank’s buildings mimic the behavior of an enlarged paper model quite literally and precisely. And in fact, the whole technological advancement of the practice was focused around translating that paper model most accurately into something build-able. Iman Ansari: So where is the "real architecture" here: in the building or in the paper model? It seems to me that the ‘real architecture’ lies in the paper model. The building is merely a large-scale representation, a titanium built-model, of a ‘real’ idea that is imbedded in the paper object. Edwin Chan: I think Frank would disagree with that. For Frank the real architecture is in the building and he very much sees himself and his practice as the master-builder. And it is very much about being in the spaces. When you visit the buildings, it is very much about the pleasure of being in the building and the kind of sensuality and the experience of being in the spaces. And there is no question that the building is the important one here. In that sense everything and every step you take is a way towards getting to the end result, which is the building. I think he believes in it. So the model, as much as it is "architectural," it is not "architecture" as an end product. And definitely a representation, as in drawing of the building, is irrelevant to the process. Iman Ansari: We talked about the binoculars earlier in the Chiat/Day/Mojo project. Similar to other sculptures of Claes Oldenburg, the binoculars were interesting in that they were large-scale representation of the idea of the real pair of binoculars, which are of a much smaller scale and with different material characteristics. But unlike other sculptures of Claes, the binoculars here were forced to become "architecture" by punching windows through them and impregnating them with program. So in that sense we could look at all the other buildings of Frank Gehry as paper models built out of scale and cladded with aluminum or titanium. How does Frank Gehry’s architecture differ from Claes Oldenburg’s artworks? How is it different from the binoculars? Edwin Chan: I think with Frank, it is very much about being in the spaces. And the model and the different scales, whether they are computer models or other mediums, they are only steps that allow you to finally achieve the result of being in the spaces. And in that sense I would say that for Frank, the idea of human activities, and the architecture as a sort of backdrop or a way to activate the spaces is absolutely paramount and essential to what he is trying to create. In some ways there is an idea that a sculptural iconic architecture lends itself to stimulating a kind of interaction of urban activity and life. So in that sense it is still quite urbanistically driven. I think the creative process is very much like a journey, where there is a starting point and presumably a destination, which is perhaps in the building as the final product. So the process is accumulative of all the experiences that get you closer to the end. So they are bit and pieces of a bigger picture and it's not so much of representation per se, but rather means to an end. So in some cases we may start with a physical model because that is the most immediate and tactile thing you could do. But as the ideas evolve and when it is appropriate you may want to rely on the computer or do freehand sketches, or build a mock-up of the building, but they are all part of this creative process that would get you eventually to the ultimate fulfillment which is the building. Iman Ansari: Let's talk about Disney Music Hall. Last time I was in LA, I was walking to Disney Hall and looking it up on the satellite map on my phone, but I had a hard time finding it because in the aerial view you only see a perfectly shaped rectangular box. And when I finally realized that is the Disney music hall I couldn't believe it because that wasn't the image I had of the building and something I expected to see from above. Edwin Chan: It is true and Disney hall is interesting because as you experience the building there is a very clear demarcation between the box, which is the interior of the hall, and the very sculptural exuberant exterior, which is where all the public functions are. And the reason for that is that the acoustics for the hall is best when it is a rectangle. Although within the hall there are sculptural elements that would help enhance the acoustic experience. So in that sense the interior was very successful. The building was very much inspired by Scharoun's concert hall in Berlin, and it is an architecture that is about how people move around and is about creating experiential spaces as opposed to intellectual diagrams. But also Disney Hall is sitting on a few floors of parking and the idea is that the building would bring the people up from the parking inside. So there is that connection to LA car culture, and there is an infrastructural aspect to it. And the circulation to ground level is very much designed as an important experiential sequence to the building. So as you work your way up from the lobby, you are occupying the space between the exuberant exterior, and the box interior of the concert hall. Iman Ansari: So is this clear demarcation the way those sketch models - the massing wood blocks and the added paper surfaces around them - evolve or translate into architecture, or is it only unique to this project? Edwin Chan: Although this is an interesting strategy in design, it is unique to this project because the best configuration for the concert hall just happened to be a box. So I would rather call the spaces in between as interstitial spaces as opposed to poche spaces. Through these spaces you are always navigating through the rigor of the box and the sculptural expression if the exterior surfaces. And then the garden outside is also interesting because it very much connects the experience of building to the city. So there are moments in the project when the box makes its appearance. The skin erupts into enclosing the volume. So there is always this kind of a dialogue between the surface and the box. But in some projects the box disappears completely. It depends on the circumstances. In this case it was absolutely curtail that the rigor and the discipline of that become the core of the project and all the spaces evolve around it. You could also say that when you design a project that is very sculptural it's useful to have some kind of rational anchor. So even in Bilbao there is a very rational anchor, classical galleries. Those are the classical galleries that are made for the classical collection. The classical core becomes the anchor that makes everything work. As a compositional strategy there is something to be said. Iman Ansari: Looking back today at Frank Gehry's work, which projects do you think stands out for you the most? Edwin Chan: I think most people might think Bilbao or Disney hall, but I would guess that if you ask Frank that question, he would probably have a very different list. I think one of the projects that was very important to Frank was the Rouse company. It was a project he worked on before he became the "Frank Gehry" he is today. He always talked about it as a very important piece in a sense that a lot of the ideas that he developed later came out of that project, such as ideas about open spaces, furniture design, and etc. in Frank's mind it was a unique project in a sense that he was able to bring the interior, exterior, and the planning all together in a coherent solution. Another project of Frank's that I really like is a little house that he did in the 80’s, called the Winton guesthouse which was an addition to a Philipp Johnson House. I have always liked that project because there is a very clear expression of volumes and sculpture, in a sense that the guesthouse is a very beautiful sculpture in the landscape. And at that time Frank was very interested in the idea of still-life and the project works as series of volumes that work very well with the original Philipp Johnson house. Iman Ansari: When you think of great architects in our history, they each had a larger project, or a thesis if you will, that defined the body of their work. Each project was an investigation or exploration towards a larger project or search that defined their career. In your opinion, what is Frank Gehry's project? Edwin Chan: Frank has created pretty amazing buildings in his lifetime. But from my point of view, and I suspect that Frank would probably agree with me, his greatest legacy is the way he has designed his office. And when I say design, I don't mean design as a kind of physical edifice or style, but I mean in that he has conceived of and organized his office in a certain way that has enabled him to make the kind of architecture that he wants to make. Frank always felt that in the early days of his practice his ability to explore architecture and creative issues were always limited to the way the construction industry has been set up. So the focus of the practice is about trying to free yourself and taking control of the situation and to be able to empower to explore all these things. This has to do with the design process, the way the office is organized, and a lot of it has to do with the use of technology, such as aerospace technology and CATIA, that freed him from the kind of constrains that the construction industry imposes, to explore the kind of aesthetic and formal ideas that interests him. So the design of his office in this way is an important part of his legacy that is different from a traditional office.